I started reading about him several days, seems to be a McDermott kind of guy. 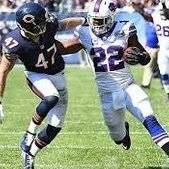 He was at best to go somewhere in the 3rd rd or later but now I see that one of the pundits is projecting Buffalo to take him with their 2nd rd pick. Funny thing is that I’ve been expecting Buffalo to pick up DT Gerald McCoy in FA if he were to become released. If Buffalo ends up with both players we would be loaded with McCoys! Lol! "Your 2019 Buffalo Bills - The Real McCoy's"
If my memory is correct, I think he did quite well at the Sr. Bowl and was mentioned as a possible Bills target then. . . . 3rd round seems like a good value for him, potential Day 1 starter. Now we just need the Patriots to find a Hatfield. Yes, but which one is the real McCoy? I am so done with Bills players named Erik.